If tracking time as you go each day isn’t your thing, you can enter all of your time for the week using Harvest’s Week View. 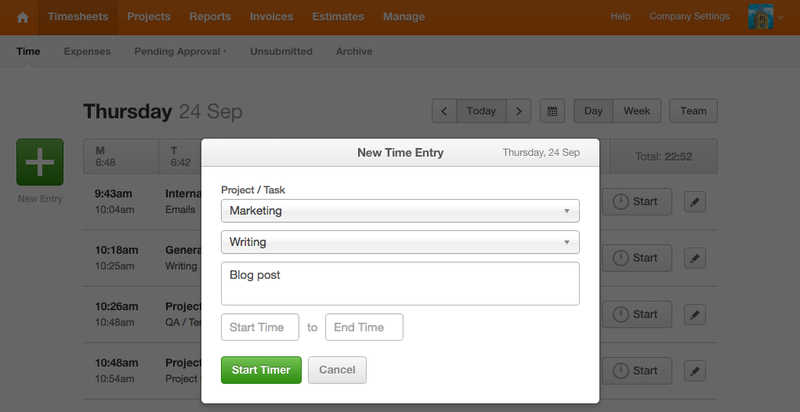 Click the Week button in the top right corner of your Timesheet and you’ll be able to add rows to enter all of your time for various tasks for the entire week. You can change the method of entry on your timesheet from Duration (where you enter the amount of time you worked as a total, i.e. 5 hours) to Start and End Time (where you enter the actual times you worked on a given task, i.e. 9:00 to 10:00). To do that, head to Settings > Edit Preferences > Timer Mode. It’s best to make this decision early on. That’s because time entries made using the duration method won’t be converted if you switch to tracking start and end times. If you plan to enter time via the week view, you’ll need to track time using duration. You can change the way Harvest displays your time on your Timesheets from Decimal format (e.g., 2 hours and 15 minutes appears as 2.25) to HH:MM (e.g., 2 hours and 15 minutes appears as 2:15). To do that, head to Settings > Edit Preferences > Time Display. Decimal is more precise and is what Harvest uses in all Reports and Invoices, but many people find the Hours and Minutes display more readable. It’s up to you! This company-wide setting only applies to Timesheets. Invoices and Reports will always display time in decimal form. Got it. How do we get paid for our work?